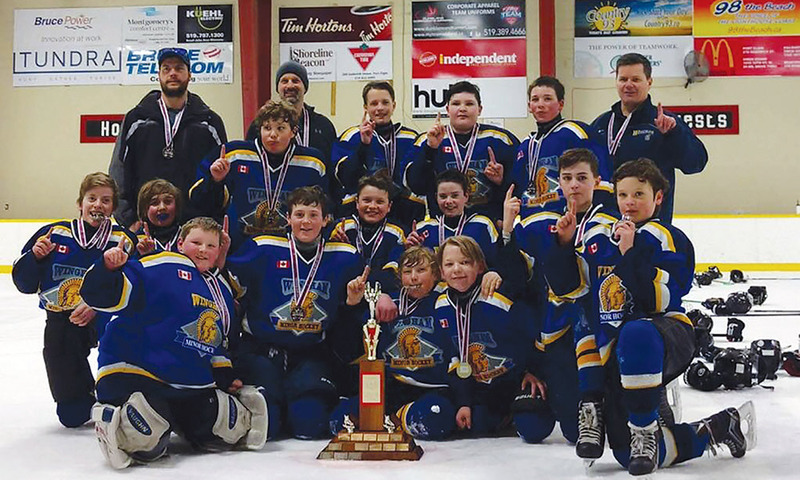 The Wingham PeeWee hockey team set its sights on aiding the Juvenile Diabetes Research Foundation (JDRF) and have gone above and beyond expectations. As part of the team’s bid to enter and win the Chevrolet Good Deeds Cup, a competition that tasks PeeWee hockey teams with helping out their community, the squad hosted a three-on-three hockey tournament, meal and silent auction earlier this year. The events raised $15,115 that the team donated to the JDRF in a special ceremony at the North Huron Wescast Community Centre at the beginning of the Silver Stick tournament that wrapped up over the weekend in Wingham and Blyth. Coach Rob Harrison said that, as part of its efforts in the Good Deeds Cup, the team was looking for a charity to donate to and naturally came to the JDRF. According to Harrison, Addy McPherson, the player who was diagnosed with Type 1 Diabetes, and her family, including father Scott faced some difficult situations when Addy was being diagnosed. He said the team thought it was a great idea to raise money for the JDRF which “has, in a lot of ways, saved [Addy’s] life”, Harrison said. Harrison explained that the team originally set out to raise $3,000 through the tournament, dinner and auction, but the response was overwhelming. The team has received its entry package for the Good Deeds Cup, Harrison said, and next is preparing a one-minute YouTube video to try and generate support. The Good Deeds Cup is won through votes. If the Wingham PeeWee team makes it to that stage, the players and coaching staff will be reaching out to the community to encourage people to vote. The winners of the Good Deeds Cup receive $100,000 to donate to a charity of the team’s choice, are profiled on Hockey Night in Canada, featured in a ceremony in the team’s hometown and immortalized on the Good Deeds Cup. Going forward, however, the team is going to continue trying to be a force for good in the community by planning to help with a Stuff the Bus campaign and being part of the Santa Claus parade in Wingham this weekend. For more information, search for ‘Wingham PEE WEE “Good Deeds” 2018/19’ on Facebook. During North Huron Council’s Nov. 19 meeting, Councillor Trevor Seip commended the team on its efforts. He said it was “humbling” to hear the team had overshot its goal by so much. “I’m very happy to be a part of it,” he said. “That was an excellent idea from children and it shows what they can do when they put their minds to something. Seip said the team would continue to have his support through the Good Deeds Cup process and through the other efforts it plans to undertakes.